IT’S 50 years ago this month that steam locomotives last ran in regular service on the main lines of British Railways. For me these were days filled with nostalgia as I spent my gap year of 1967-68 travelling the country on railrovers trying to ride behind the last remnants of steam before it disappeared. Back then, neither I nor my transpotting friends would have reckoned in our wildest dreams that main line steam would still be with us – thanks to the rules of privatisation which guarantee open access to any operator who can find space in the timetable between the services of the regular train companies. An astonishing 500 steam trips each year run on the main line, with locomotives provided by private owners. 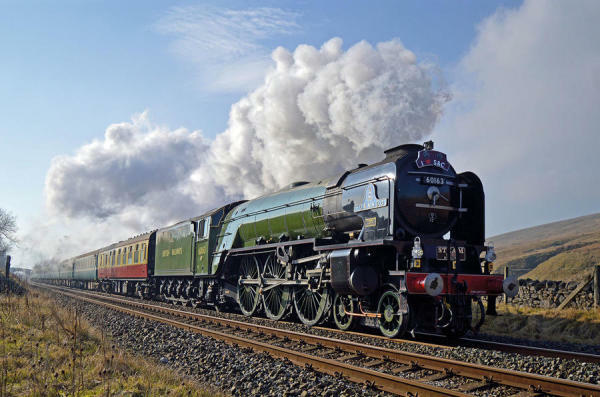 preservation societies and even, in the case of the Flying Scotsman, by the nation. A recent Network Rail paper says that these operations bring ‘a positive benefit to to both the rail industry and to UK plc’ adding that steam charters ‘boost local economies by bringing tourism to key destinations” creating an ’empathy for the railway which aids Network Rail’s profile’. Sure there are problems. The railway is getting fuller and faster, with fewer gaps in the service for slower steam trains limited to 75mph. There is the occasional breakdown which gets into the headlines. The rolling stick is ageing, too, with a lack of modern safety features such as central door locking on the coaches. But heritage steam is now so embedded in in the British psyche that nobody would dare tamper with it too much. When recently the services on the Settle and Carlisle line were operated by timetabled steam, passenger numbers increased twenty-fold and the story went round the world. Not only does it have a special magic of its own, with nothing to compare with the sight and smell of a mainline engine at full power, but steam represents the ideal that railway privatisation supposedly promised. As the Railway Magazine points out, these trains run without direct subsidy or any insistence from the Department of Transport – they really do exist because people want them to.